Jonathan Linford was raised in Arizona as the oldest of seven children. At age 19, Jon served a two-year mission for his church on the islands of Tahiti. After returning to Arizona, he attended Brigham Young University in Utah, where he obtained a Bachelor’s degree in Political Science. Jon attended law school at the University of Arizona. During law school, he was a teaching assistant to the Dean for the Legal Writing Department and received recognition for excellence in legal writing. Jon was the team leader of the Ninth Circuit Pro Bono Appellate Program, and during his first summer of law school, he clerked for the Governor’s office of General Counsel. After law school, Jon and his growing family moved to Northern Arizona where he practiced in many different legal areas. Of those different areas of law, Jon discovered that he especially enjoyed working with families to protect and distribute their hard-earned assets according to their wishes. 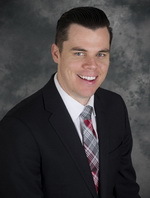 Jon was pleased to join the experienced attorneys of Morris Hall and has focused his practice on estate planning, business planning, estate administration and probate. Jon and his wife, Maurine, currently reside in Clarkdale, Arizona with their four children. Jon enjoys spending much of his time outdoors, including hiking and mountain biking. Morris Hall P.L.L.C. is a firm focusing on estate planning, probate, trust administration and elder law issues. Based in Phoenix, AZ, our mission is to provide residents of Phoenix and surrounding areas with quality estate planning resources, such as assistance with Living Trusts, Wills (simple & complex), Probate, Trust Administration, Powers of Attorney, Living Wills, Irrevocable Trusts, Family Limited Partnerships, and Charitable Giving. When you visit or call our office, we want you to feel comfortable discussing such an important issue concerning both you and your family. We want to arm you with the information you need to make an informed decision about your family's future. Visit our online Estate Planning Information Center to obtain timely, quality information on estate planning and related issues, including complimentary issues of our Special Reports and Estate Planning News articles. Residents of Phoenix and surrounding areas can register to attend our Estate Planning Seminars. Law Firm: Morris Hall P.L.L.C.